In the dystopian near future, chicken has been banned, and the United States of America’s two most powerful government agencies are the FDA and USDA—they enforce the ban on chicken meat after an outbreak of bird flu kills millions, keeping citizens safe from foul contraband. FDA agent Tony Chu is a cibopath, someone who gets all the psychic memories of anything he eats with the exception of his gastrointestinal kryptonite: beets. He and his cyborg partner, John Colby, hunt down black-market chicken restaurants, doomsday poultry cults, and a host of villains with food-related powers, sometimes with the assistance of Secret Agent Poyo, a cybernetic chicken luchador who protects us all from such threats as Mecha-Turducken. Yes, food-related powers. 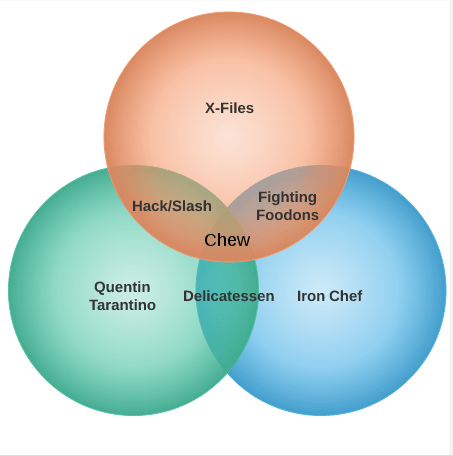 These powers are a big part of the big mystery in Chew: Where did all of them come from? Are they tied to the bird-flu epidemic and the glowing glyphs that appeared in orbit around the Earth? Are we doomed? Can Poyo save us all? It makes more sense if you read the book. There are a handful of people with these one-off powers, such as Amelia Mintz, the saboscrivner who can make you taste the food she writes about in her restaurant review column, and the xocoscalpere who can carve real, functional weapons out of chocolate (shuriken, knives, and even guns!). Rob Guillory’s art does a great job of keeping the time period hard to pin down, the violence wacky, and the facial expressions over the top. He fills the background with lots of clever little jokes—you’ll hardly ever find a page without a poster or T-shirt with an inside joke or pop-culture reference. The art definitely rewards you for taking your time with every panel. 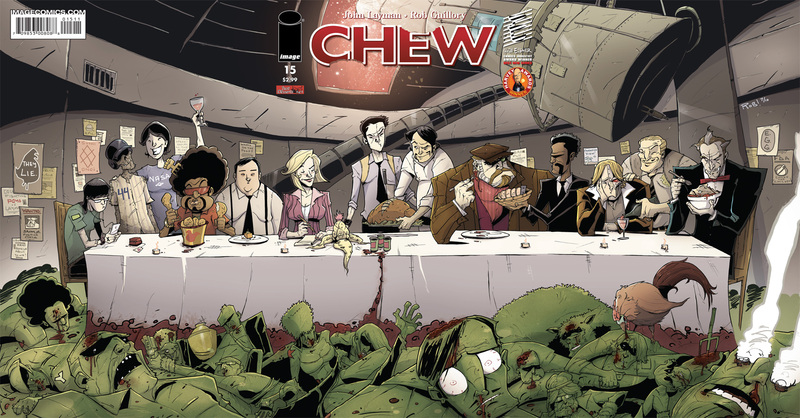 The previously mentioned wacky violence is over the top and cartoony, but if you have an aversion to even the most comical of blood geysers, the artistic style of Chew might not be for you. 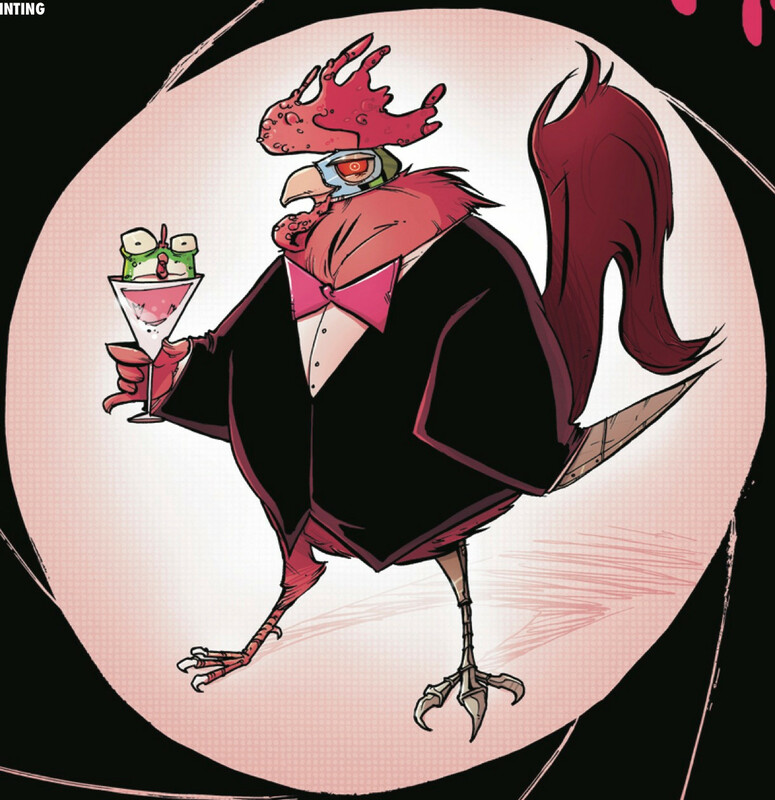 At the time of writing this review, the most recent issue of Chew is #46. The first forty issues are collected in four hardcover “Omnivore Editions,” which are pretty reasonably priced and a great way to collect and read the series. They’re beautiful books and worth getting in hardcover to preserve the page sizes and readability. You should really give this series a shot—there’s a reason it won an Eisner Award for Best New Series in 2011 and two Harvey Awards for Best New Series and Best New Talent. Chew is an Image comic that sells well and in addition to winning the awards, yet whenever I bring it up in conversation, most people haven’t even heard of it. 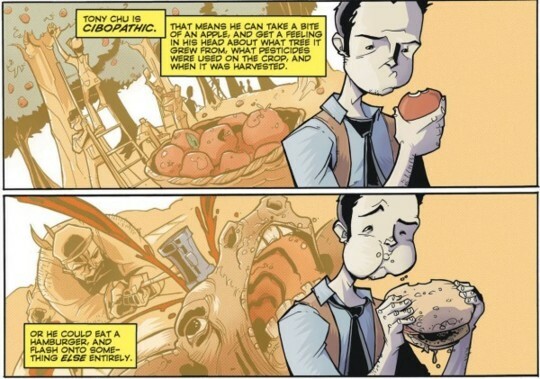 Remedy this, because Chew is one of the best comics you’re probably not reading. Nick Glover is a Twin Cities comedian, podcaster, and network administrator with the power of one million exploding suns. You can listen to him host Geeks Without God weekly and see him perform in Vilification Tennis monthly-ish. He also performs on the street and stage at the Minnesota Renaissance Festival on weekends in August and September, look for him in Vilification Tennis and the award-winning Wise Fools Improv. Image has been releasing some great titles lately.